The author of Unprocessed talks about how she now feels “fuller” and how engaging individually with food can help to increase collective power. Say you’re making spaghetti and red sauce and you want to avoid eating processed foods. Which of these would you choose? 1. A jar of a branded sauce dubbed “Organic Traditional,” with an extensive “all natural” ingredient list that includes soybean oil, sugar, and Romano cheese. 3. A quart of crushed tomatoes that your neighbor preserved in jars using a water bath canner. This is the kind of question food writer Megan Kimble tussled with in her year-long quest to eat nothing processed. 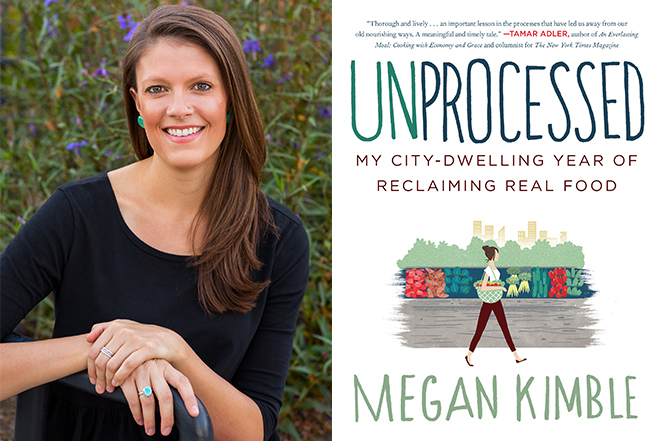 She chronicled the year’s ups and downs and lessons learned in Unprocessed: My City-Dwelling Year of Reclaiming Real Food. Early on, Kimble noticed a wrinkle in embarking on such a challenge. It wasn’t as simple about giving up soda and chips for a year. Practically everything we eat is processed, “by way of harvest or heat,” she writes. In fact, all the tomato sauce options above are processed, just to varying degrees. In the book, she explored the boundaries of the word “processed” and determined for herself how much processing was too much. Kimble also wondered out loud whether eating food closer to its natural state would allow her to “be in the world and not away from it.” And she asked whether it would be affordable. Kimble’s adventures took place in and around Tucson, Arizona, where she lives and works as managing editor of Edible Baja Arizona. From a maze of Safeway aisles to a sheep butchering workshop, Kimble takes her readers along for a ride filled with both humor and grace. And she serves up much more than a reported account of what happened along the way; she connects the dots between food that is “too processed” and the global corporate interests behind the industrial food chain, and offers practical tips for how to “unprocess” ourselves. “If 70 percent of all food calories we eat are processed, then the logic is inescapable—most of our food dollars are spent supporting companies that may or may not serve our best interests,” Kimble writes. I caught up with Kimble this month by phone. Below is an excerpt of a longer conversation. You write that although consumer consciousness has swelled and awareness of local, organic, and sustainable has grown, that collective shift is not being seen at the cash register. In 2012, farmers’ markets accounted for only 1 percent of total food sales and organics represented 2 percent of grocery sales. How do you account for that disconnect? We really have to put our money where our mouth is. In southern Arizona, where I live, farmers and producers struggle to make a living. If I don’t go buy their food, these producers are going to go out of business. And we won’t have a local food system. Yet, since writing the book, I have seen many articles including one in Fortune magazine earlier this year (“The War on Big Food”) talking about how consumers are opting out [of processed food] and companies are changing. So I’m hopeful and excited. The way we spend our dollars matters and we can definitely change the food system. You dug deep on how you can shift your spending to local. What did you discover? I spent 27 percent of my income that year on food. [Kimball earned around $20,000 that year.] On average, Americans spend about 6 percent of their income on food. That’s astounding to me. What else would I spend my money on? And I continue to spend that much money on food. You know, it is a fulfilling part of my life and it is also hard to quantify. Eating this way I feel full, nourished, and I’m cooking with friends. It has plugged me into my community. And the money is connected in a different way. You write: “Eating unprocessed wasn’t just a way to opt out of a broken food system, it was also a way to opt in.” Can you say more? At first I looked at this year as a way of opting out, a political act against the corporate system. But then I had an “aha moment,” when I realized that eating unprocessed is a really pleasurable way to experience food and community. I learned how to cook a lot of things. There was the satisfaction of being more self-reliant. It’s a way to add more joy and connection in your life and to eating. That’s not meant to sound hippie or “om shanti shanti,” but it’s really true. In the book, you detail many adventures that were part of your unprocessed year: learning to butcher meat, canning, and making your own bread, salt, and chocolate, to name a few. Which one had the greatest impact on you and the way you eat now? Making chocolate, really. I have a raging sweet tooth; learning to make chocolate forced me to learn to savor sweets. I’m never ever going to give up sugar. But it was transformative, deliberate. And learning to grind wheat into flour was transformative. I learned how wheat is processed, how we digest it. It changed the way I consume grains. I don’t bake bread anymore, but that’s because I found local artisan bakers making bread from (local Sonora) stoneground flour. I do feel better and fuller. The way I eat now is very similar—80 to 90 percent unprocessed. Now I have the freedom to eat some processed foods, when I travel, for instance—and I notice the difference. I’m more aware, and more attuned to how my body reacts to food. You know, I embarked on this project as a solo venture. But the most rewarding part of it was telling people about eating this way. It began a conversation, and I got to hear their stories. I’ve been a member of my community supported agricultural farm (CSA) for five years. I love going, I meet the volunteers, I bring my dog, and it’s a social community experience. But the community didn’t happen overnight. You have to keep showing up. It’s true of anything else. The change will come. You can slowly incorporate change into your routine. For example, buy one food item differently. Maybe it’s bread. My mom read my book with her book club, and they found a local bakery to buy their bread. Maybe it’s just one thing. But that one thing can transform the way you shop and become ingrained in the fabric of your life. How important is cooking when it comes to living an unprocessed life? Hugely important. Cooking literacy is a key component to eating better and participating in all these things. But also that it means taking small steps. Try to start slow, make a big pot of beans, a pot of rice, chop up a bell pepper. That’s cooking! People all over the world cook that way. It doesn’t have to be fancy. Good ingredients practically cook themselves. What is our edible future? I would love to see greater consumer participation and empowerment. Reclaim our power, shaping the food system they want to see. Do you want to endorse General Mills or a producer in your community? I mention a Local First Arizona study in the book, and I’ll mention it again: If a community the size of Tucson shifted 10 percent of its spending to local businesses, within one year we would create almost $140 million in new revenue for the city. That’s a lot of money. It’s very little individual investment but collectively huge. We can act individually to increase collective power. Thanks for sharing your story! I think this is something that anyone can do regardless of diet. Whether you're vegan or paleo, you can focus on less processed local foods which use less resources and are better for the environment. I am a French medical doctor. Congratulation to start this campaign. New diseases are coming for almost all from switch from simple traditional home recipes to processed food using chemicals for distribution then to increase profits. I remember in the 60s learning, in geography course at middle school , what means the % of a family budget for food. The starting point of homo sapiens being to find food and to make it easy to eat when finding a place secure to sleep. Denying the fact that we are what we eat, is loosing a part of our freedom face to health choice. Good luck for this venture. It is encouraging to see Millennials working to be healthier and sharing their positive attitude. Cooked foods are processed foods - the most extreme form of processing. Cooking radically alters all of the molecules. Yes, many would say, the point of cooking is to alter molecules - for taste, texture, color, size and shape, to kill harmful toxins etc. She speaks of "reclaiming real food". Bread is not real food. Real food is what we find in our gardens, our lands, rivers and seas, the skies, etc. And then we eat those things raw - fresh and raw ideally, like our earliest ancestors did - if we are really not into processed food. I always marvel at articles like these. I am almost 72 years old. I live near Philadelphia PA and when I was a small child my grandmother got fresh produce from hucksters that came around to the neighborhood each week. There was a special man who only sold citrus fruits so living in the city did not diminish her ability to feed her family. Now I live in a suburban community and have no car. Getting good food is a challenge. The folks in the senior building where I live are dependent on their relatives to go to the grocery or use the senior bus that takes us to a store once a week. Dr. Dwight Lundell, a noted heart surgeon for over 25 years, finally told his patients and the world the stark but undeniable truth in 2012: chronic inflammation caused by eating processed foods and refined sugar is the real culprit in the epidemic of heart disease, stroke, diabetes and obesity in America, NOT CHOLESTEROL! After three heart attacks and a quadruple bypass I finally figured that out, but trying to eat unprocessed is nearly impossible if your only option is buying your groceries from Walmart. In my hometown of 10,000 there are two very large, very empty buildings with plenty of free parking. How would I go about creating a "totally organic, totally unprocessed" food co-op in one of these locations? this looks like a delicious read. If Miss Kimble has a page for her book or is lecturing anywhere around Tempe I would welcome the opportunity to connect into this network. Having just moved from Brooklyn the number one thing I miss is my farmers markets- I had two. Without a doubt it enriched my life and the life of our community in many many ways. Perhaps she will make an appearance at the new college for Sustainability at ASU? I hope so. Very interesting. I've started paying attention to grocery store advertising, particularly the percentage of weekly "specials" that are unprocessed ingredients. There are really very few items advertised that are simple, basic, unprocessed foods. I'd love to see a similar book with a vegan approach.